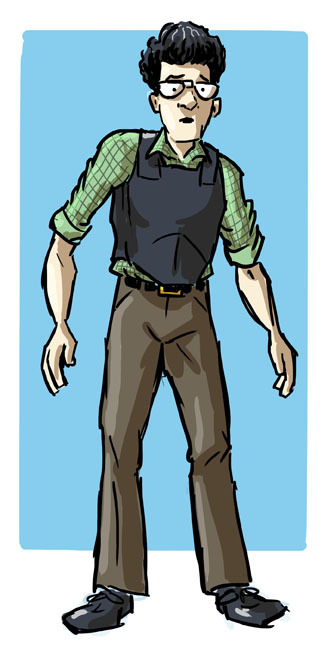 SuperFogeys - NEW CHARACTER: The Terrible Leslie! Leslie Bottoms was just a typical, down-on-his-luck, insecure Alabama geek who always seemed to arrive at the comic store just as the last issue of the hottest new issue sold out when Spy Gal’s battle with a team of Reactors lead by Gorgeous Guy spilled into his neighborhood. That’s when everything went wrong. The Reactors rifles malfunctioned and neither Spy Gal nor Gorgeous Guy seemed able to land a punch. Spy Gal quickly deduced that Leslie Bottoms possessed the power of epic bad luck, enough to affect the environment and people around him. Leslie never wanted to be a hero, preferring instead to duck his head and avoid the trouble and trauma that seemed to always follow him, but Spy Gal had other plans. She slapped a kevlar vest on Leslie to protect him in combat situations and drafted him into the resistance! Now one of the most powerful members of Spy Gal’s lead team, The Terrible Leslie is the whiny secret weapon the enemy never sees coming! Now this is a guy I can horrifically mess up trying to give a high five to! I can imagine him scarred, unable to watch most sci-fi. “It’s me. I’m the reason whole armies can’t hit the broad side of a death star! I’m the reason for the awful aim, the convenient jams, the cliche storytelling. I’m the worst of all of us! I am the Plothole!” To which everyone would assure him they’re just going to keep calling him Terrible Lesie. Looks like Harold Ramis. Rest his soul.